I made some postcards of my IR photography I took in the last week! I like the way these 4 came out. 2 shots are from this park in Quail Hill I was at on Monday, and the other two I took at the beach on Monday! I'm also going to start selling prints more often! 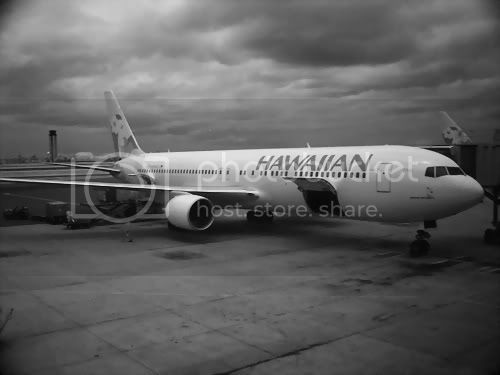 Speaking of which, as soon as I hopped off the plane, I had to snap an IR pic of it. Looks like a regular B&W pic since there wasn't much natural vegetation or distinctive colors to enhance. Still looks nice and moody, though. And speaking of postcards, there's a few coming your way soon, so be sure to check your mailbox!! I'm glad you're there safely! Enjoy yourself and drink that port! Holy crap, what bizarre pictures! I love them! I'm not even gonna ask how you maange to take pictures like that, because I know I won't get it at all, and why kill the mystery?